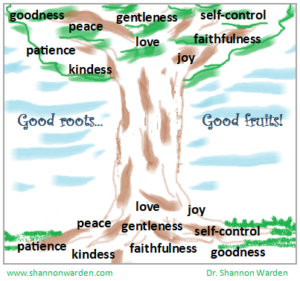 Good roots, good fruits…I’ve been thinking and talking a lot about this lately. Specifically, if you and I as parents want to see better “fruits” in terms of our children’s behavior, we must first examine our roots (how it is we behave). What are the “roots” you and I need to examine in our own lives? I’m thinking about the fruit of the Spirit (Galatians 5:22-23): love, joy, peace, patience, kindness, goodness, faithfulness, gentleness, and self-control. Before we can enjoy these “fruits,” we must first develop them as part of our roots, or our everyday way of being. Just like trees, our roots determine our fruits. Our roots and fruits then, of course, contribute to our children’s roots and fruits. So, if we, for example, treat our children with love and kindness, they’re more apt to treat us and others with love and kindness. If we exercise patience and gentleness with them, they’re more apt to respond to us and others with respect and cooperation. As you’re looking at the list of the fruit of the Spirit, you can likely pick out at least a couple and say, “I need to work on that!” Why? Because who doesn’t need to work harder to cultivate more of these fruits, or behaviors, in our lives?! To get you moving toward your goals, perhaps you could share with your family, “I’m realizing I’m not as kind as I’d like to be,” or “I need to control my words and my reactions more.” Tell them you’re going to work specifically on these areas (whichever ones you’re focusing on). Ask them to help you by letting you know if they catch you, for example, being kind or using self-control. Tell them when you feel tempted to be unkind or tempted to react in ways that you know might discourage them or hurt your relationship that you need to take a time out to calm down before handling the matter at hand. And, if you do mess up, quickly take personal accountability. Say, “I did it again. I’m sorry. Can you give me another chance?” Then get back to work on your goals. Like our children, we are not perfect. And, technically, we’ve had a lot more time to accomplish perfection, which tells us perfection will never be possible. We still feel, think, say, and do things we sometimes wish we didn’t. With this truth in mind, we can and should show our children and ourselves more compassion because we know behavior change is hard and requires ongoing effort. On the subject of compassion, I know for some of you, it is hard to be compassionate toward yourself. Perhaps you came from a home where compassion was rare, or perhaps you’re really driven and feel like your value rests in your performance. Whatever the case, I encourage you to think more about just how unrealistic perfection is and how self-compassion may help you stress a little less. More than simply think about self-compassion, actually, if you’re working on cultivating the fruit of the Spirit in your life, that can naturally feed into self-compassion. Remember…love, joy, peace, patience, kindness, goodness, faithfulness, gentleness, and self-control. You’re not only cultivating these roots and fruits for the sake of your children; you’re cultivating them for your own benefit as well. Showing yourself more love, patience, kindness, etc., can change your life for the better. There’s no denying the fruit of the Spirit are great goals for us to strive for in life. But, the striving part really can wear us down. I often refer to Ecclesiastes 4:6, which basically instructs us to rest rather than strive after things that we can never fully attain (like perfection). The good news about the fruit of the Spirit is that, if we focus on our relationship with God—really make Him the top priority, pray, listen, study the Bible, live out His principles—the fruit of the Spirit will naturally emerge in our lives without us having strive so hard. These are the fruits of being rooted in the Lord. If we tend to our relationship with God, He will tend to our roots and fruits. Some people would respond, “I have or can have the ‘fruit of the Spirit’ without a relationship with God or without even believing in God.” Yes, you can have the “fruit” of positive behavior aside from God. I, too, like to think I am a “good person,” but my relationship with God changes me in ways that I can’t easily describe. I know what it is like to be nice and good on my own, and I know how much easier being good and nice is when I feel God’s presence in my life, leading me, supporting me, holding me accountable in ways that are higher and better than what I can do on my own. He certainly has changed and continues changing my parenting and family life for the better, and I want to give Him proper credit for that. I want to tell you about an amazing new resource I’ve discovered: https://axis.org/. Axis’ mission is helping parents understand and engage with their teenagers. You can get their free “culture translator” email each week and, through that, learn about the music, television, movies, apps, trends, etc., that your teenager is involved with. You can also find tons of free and low-cost parenting resources that can help you cultivate better roots and fruits in your family life. And, shameless plug, look for the video I did with Axis for their fall 2018 Teen Summit. I’m talking about what else…letting go of imperfection! What fruit of the Spirit are you working to cultivate right now and how? Encourage others by sharing your thoughts below in the comments section. I’ll do my best to get those posted as quickly as possible. For more ideas and encouragement, “follow me” @drshannonwarden (Facebook, Twitter, & Instagram). And, sign up to receive my Hope to Build On blog by email. Don’t worry! You’ll see that I only blog about once a month, so signing up for emails won’t inundate your inbox.